De Dietrich Process Systems is committed to continued innovation in the field of powder handling. 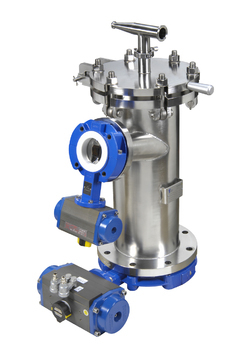 At the heart of our expertise is the Powder Pump, a robust apparatus for conveying/charging powder from one piece of equipment to another using the dense phase flow operating principle. The Powder Pump incorporates proven concepts with cutting-edge technologies, bringing new perspectives to your powder handling processes. Simply put, we can design a solution to efficiently move your powder from one piece of equipment to another, while maintaining important aspects of the process including product integrity and operational safety. By defining the specifications of your starting point and ending point, DDPS is able integrate the appropriate equipment into the design to achieve a customized solution to fit your needs. In addition to stand-alone powder handling equipment, DDPS has the expertise to offer an entire system that is designed, provided, and supported by DDPS (including externally-sourced items where required). 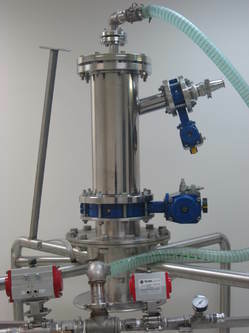 Our engineered systems capabilities will help define a solution to your problem and provide a completely integrated powder handling system that is unique to whatever your individual requirements may be. DDPS’ powder transfer solutions are versatile in their ability to handle a range of applications, from the stringent demands of high purity pharmaceutical applications down to the bulk requirements of the chemical industry. 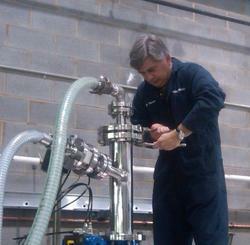 Simple in design, construction and operation, the Powder Pump and CSV are the foundation of our transfer technologies. They not only increases the safety of your material handling by preventing the cross contamination of potentially hazardous powders, but the Powder Pump and CSV can also enable you to comply with cGMP requirements and furthermore improve the hygiene and ease of cleaning of your production facility. 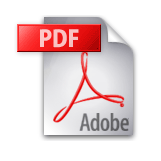 Learn more about our powder transfer equipment. As your solutions provider for powder handling systems, De Dietrich Process Systems offers a range of comprehensive services around our expertise, providing you with the support needed throughout the life cycle of your equipment. The ability to perform demonstrations and tests on your actual solid at your site with our rental units will allow DDPS to provide a performance guarantee prior to integrating the equipment in your production line. Our full range of US-based support services include project management, process engineering, controls, engineering, validation, testing, seminars, demonstrations and more. Learn more about our powder handling services.